Ever bought a black car to hide dirt and grime? Bushmaster had the same idea. Jokes aside, the all-black beauty fittingly dubbed the "BlackDog" Bowie is one hell of a serious fixed blade knife, with ample power to tackle even the toughest back country or tactical jobs and distinctively menacing style to boot! The BlackDog is an ominous abyss of pure black, from the bitter point to the uniquely dimpled pommel. But there's more to this savage hellhound than simply what meets the eye. Menacing and razor sharp, the potent clip point blade is forged from rock-solid stainless steel. Though plenty resilient on its own, the blade gets an extra dose of corrosion resistance from that sweet nonreflective black finish. Wicked jimping along the spine and a chic cutout add style, while a convenient guard-adjacent finger choil provides improved control. 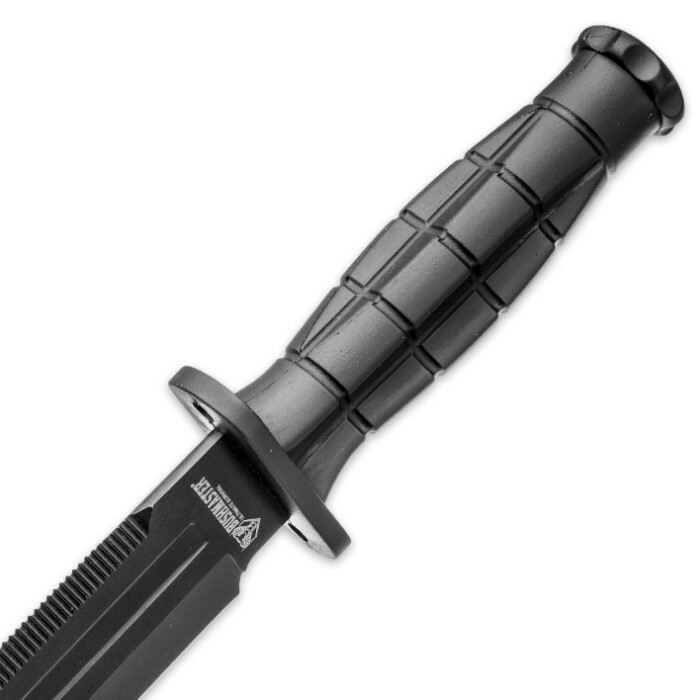 Made of a state-of-the-art polymer, the "BlackDog's" handle is rugged yet lightweight and features unique contours that afford a fatigue-reducing, no-slip grip. Its design evokes vintage "pineapple" grenades. 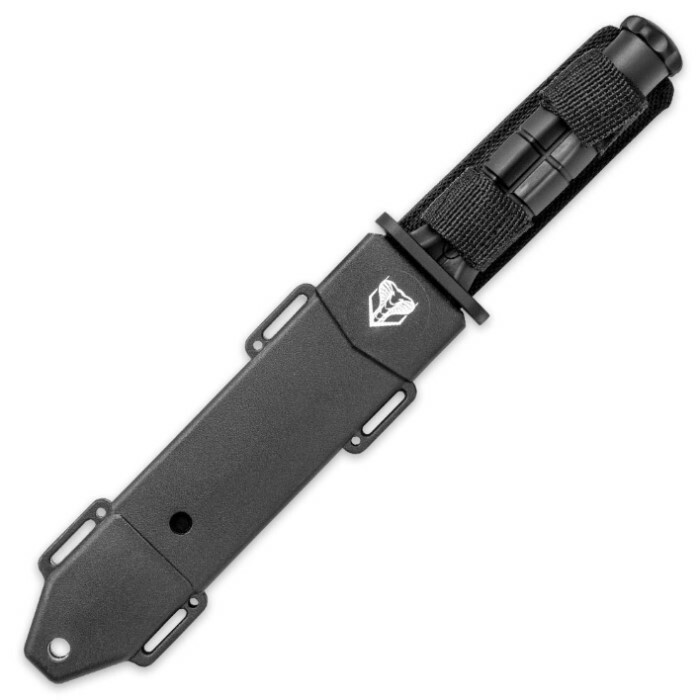 Even the included tactical sheath is in a league of "tough" all its own, boasting nigh-unbreakable rigid polymer construction paired with heavy duty nylon straps and belt loop. 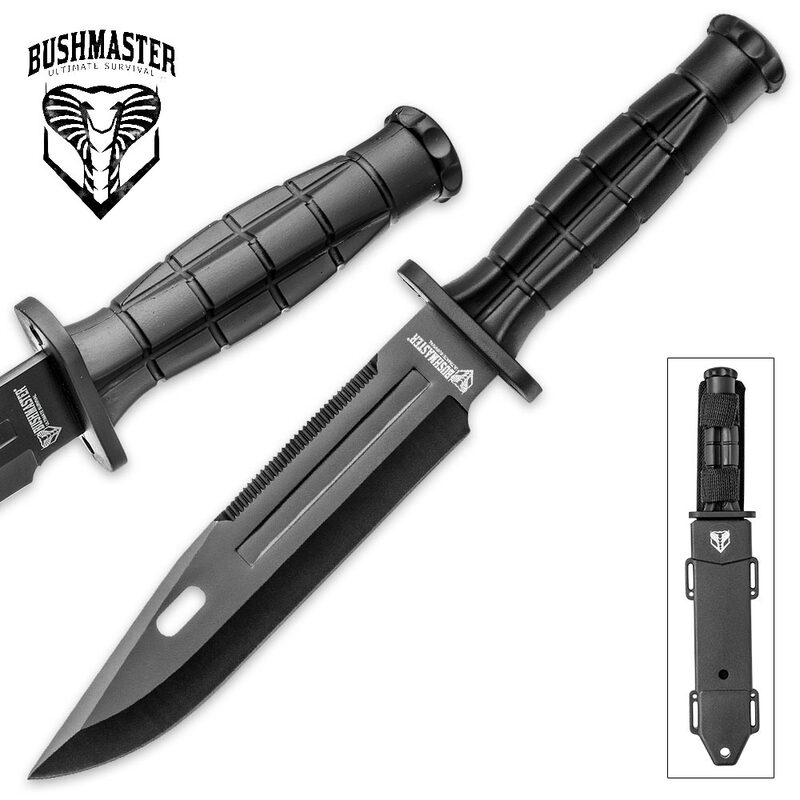 With its savage looks, ominous vibe and intense real-world power, Bushmaster's "BlackDog" Bowie is both a sight to behold and a force to be reckoned with! Love the look and feel of this knife. The handle is rubberized. The blade is straight and sharp. Lightweight. Great night-time knife. Bushmaster has never let me down. Thanks BudK! It is sharp, light and very fast. The handle is plastic but, unlike other knifes it fits very well and is not annoying to handle. Very pleased with it.